The first measurable difference between golfers of different skill levels is the ability to hit the ground in the same place time after time which is referred to as controlling the low point. The most skilled player not only hits the ground in the same spot every time but also hits the ground in front of the ball on every swing, in slightly varying degrees. The less-skilled player hits the ground farther back behind the ball or not at all and with a wider dispersion from shot to shot. One piece of the swing which will help you control the low point is maintaining a steady head position. When the head is stable the precision with which the club hits the ground increases.If the head moves back during the backswing you are forced to lunge forward in the downswing which creates a complicated and highly unpredictable swing. 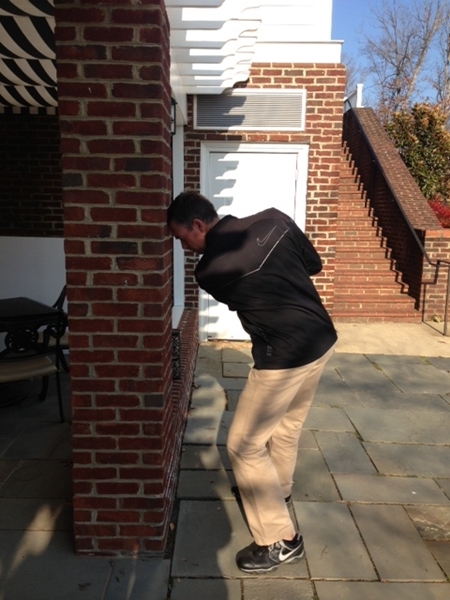 An exercise that you can use at home to help you practice a steady head is the “head on the wall” drill. 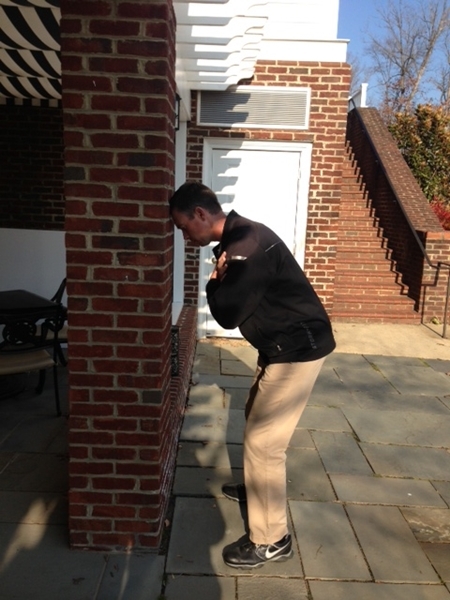 Place your head lightly against a wall with your arms crossed and hands on your shoulders (picture 1). 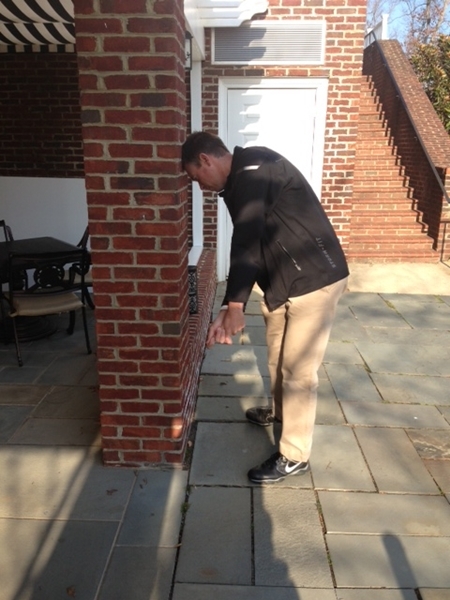 Pivot your body to where your shoulders reach close to 90 degrees and keep your head from moving up/down the wall or to the left or right of where you started (picture 2). 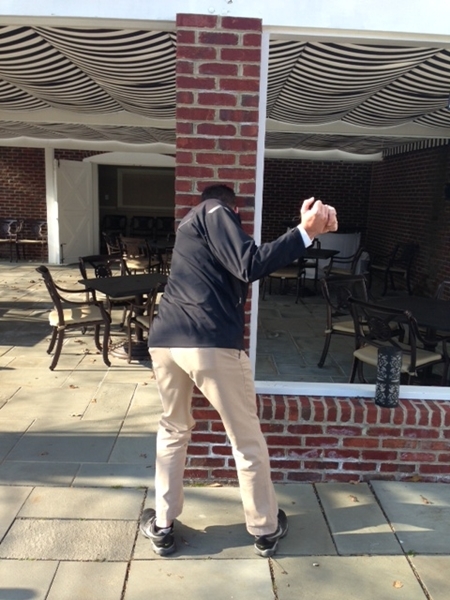 A variation of the exercise is to take an interlock grip while lightly touching the wall and make swings incorporating your arms and maintaining the stable head position (picture 3/4). 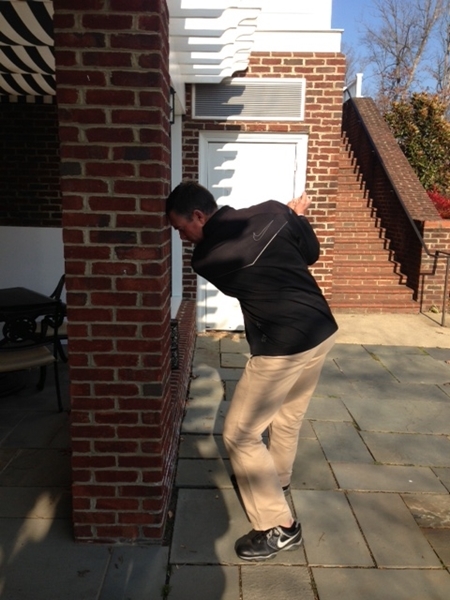 For additional precision move down to impact maintaining the steady head you had in the backswing (picture 5). Doing these exercises will start to create the feeling of a stable head during your swing and get you started in the right direction for improving contact. In summary, more skilled players are better at controlling the low point than less-skilled players which allows them to hit the ball more solidly time and time again. Keeping a stable head position during the swing increases the precision in which you control the low point. In future tips I will discuss other pieces of the swing to help control the low point. Start with this first and you will be on your way to hitting more consistent shots and achieve better contact.